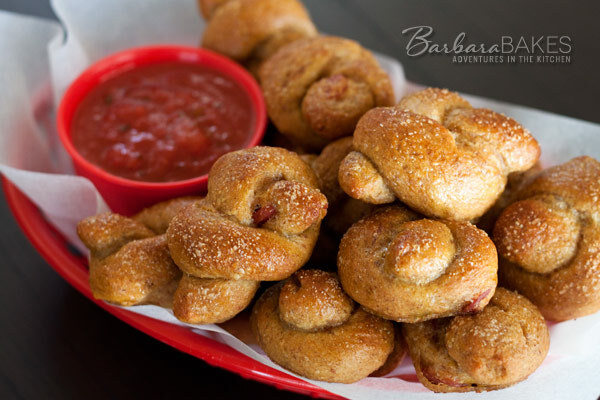 A cross between pepperoni pizza and soft pretzels, these fun pepperoni pizza knots are perfect party food for the upcoming bowl games this holiday season. If you’re a college football fan, you look forward to this time of year because of the bowl games. When you’re watching football, you want easy to eat, easy to share finger foods. These pretzel knots fit the bill perfectly. Serve them with an easy to make homemade pizza sauce. I created this recipe for the Hodgson Mill’s Third-Annual “Have a GRAIN Holiday” Baking Contest. This is my third year participating. The first year I made a Citrus Cranberry Cream Cheese Danish Braid. Last year I created Pumpkin Fantail Cinnamon Rolls with Maple Cream Cheese Icing. This year I thought it would be fun to do a savory recipe. Hodgson Mill produces high quality flours. I was sent packages of their White Whole Wheat Flour, Organic White Flour, and Whole Wheat Pastry Flour. I decided to use all three flours in this recipe. I generally use no more than 50% whole wheat flour when I bake breads, but the whole wheat pastry flour is finely ground, so it doesn’t weigh down your baked goods, and I used 75% whole wheat flour in this recipe. If you don’t have whole wheat pastry flour at home, just use half whole wheat flour and half all purpose flour. Of course you could also make them with just all-purpose flour. You’ll need to add a bit more flour because whole wheat flour absorbs more water. I topped the pretzels with a little garlic salt, but use coarse salt if you prefer. These pretzel knots are fun to make and easy to shape, and no one will notice that you made them a little bit better for you by adding whole wheat flour to the preztels. I’m sure they’d be a big hit with any football crowd. Mix whole wheat flour, whole wheat pastry flour, yeast and salt in stand mixer fitted with a beater blade. Turn mixer to low and add the warm water. Beat on medium speed for 3 minutes. Switch to the dough hook, gradually add the all-purpose flour (add more or less as necessary) until dough clings to the hook and almost cleans the sides. Knead until the dough is smooth, about 5 minutes. Scrap the dough off the dough hook in to the bowl and add the diced pepperoni. With the dough hook, knead the pepperoni in to the dough. Turn dough onto lightly floured counter and knead briefly to form a round ball. Coat a large bowl with non-stick cooking spray. Place dough in bowl and coat surface of dough with non-cooking spray. Cover bowl with plastic wrap and let rise until it has doubled in size, about 60 minutes. Punch down the dough, cover it and let rest for 5 minutes. Divide the dough into 8 equal pieces. Work with one piece at a time and keep the remaining dough covered. Roll each portion into a 12-inch-long rope. Cut each rope in to three pieces and roll each piece in to an 8-inch-long rope. Tie each piece into a knot. Place on a baking sheet that has been sprayed with non-stick cooking spray. Cover and repeat with remaining pieces. Let rise for 15 minutes. Bring to boil 8 cups of water and 1/2 cup baking soda in a large saucepan or Dutch oven. Carefully drop knots, 6 at a time, into the boiling water. Cook for 15 seconds on one side, flip and cook 15 seconds on the other side. Using a large slotted spoon, remove knots from water and return to cookie sheet. Mix the beaten egg with 1 tablespoon water. Lightly brush the pretzel tops with the egg wash and season liberally with garlic salt. Bake at 425°F for 10 minutes or until the pretzels are deep golden brown. Transfer to a wire rack to cool. In a small saucepan, sauté garlic in oil until tender. Stir in the remaining ingredients. Bring to a boil. Reduce heat; simmer, uncovered, for 30 minutes or until sauce reaches desired thickness. Sauce may be refrigerated for up to 1 week. Update: The giveaway is now closed. Thanks for entering! 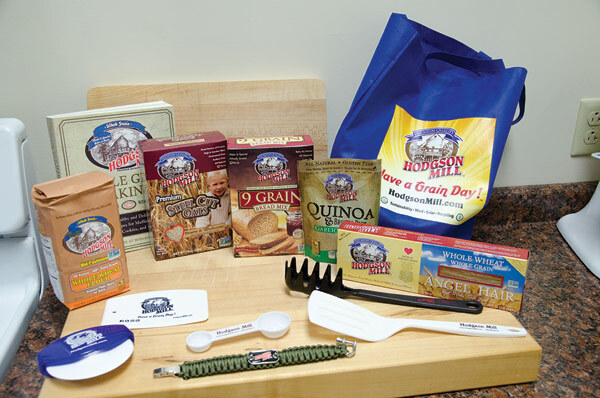 Hodgson Mill is giving away to one lucky Barbara Bakes reader an assortment of Hodgson Mill products, your choice of gluten free or whole wheat products, a $25 value. Leave a comment on this post before Wednesday, December 18th at noon, MST. 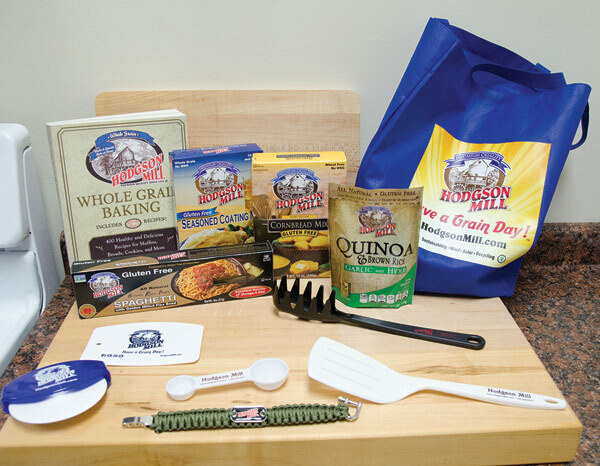 In addition Hodgson Mill is also hosting a “25 Days of GRAIN Holiday” Sweepstakes open to the general public via Facebook. One winner will be selected to win every day for 25 days, 12/1/13 until 12/25/13 – their choice of $25 worth of gluten free products or an assortment of organic whole wheat baking mixes and flours. Hodgson Mill also has a coupon available this holiday season that’s good for $1 off any 5 lb. bag of Hodgson Mill® flour. Your recipe looks really great!Thanks for the giveaway! Where can I buy some of their flour? Does Harmon’s carry it, or do I have to buy it online? They look wholesome! Great to go with soup too. Pretzels, well anything with bread are a serious weakness of mine. Now that you stuffed them it gets much more serious. Those pretzel knots look delicious! 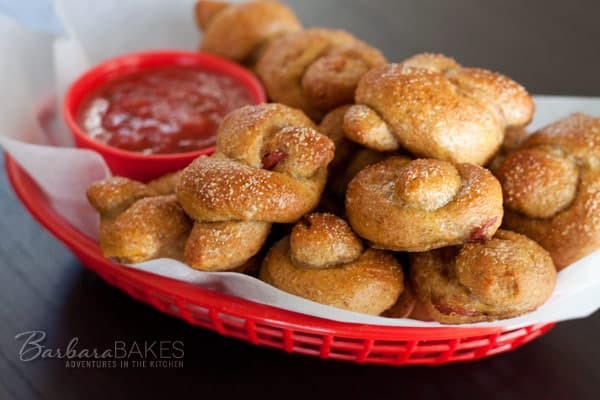 Oh I love homemade pretzels and these with pepperoni and sauce just sound wonderful! This is a defenite make for the college bowl games this year. No way we’d have whole wheat pastry flour here. It’s pretty basic shopping because we don’t have the population to justify it. Sad, I know. 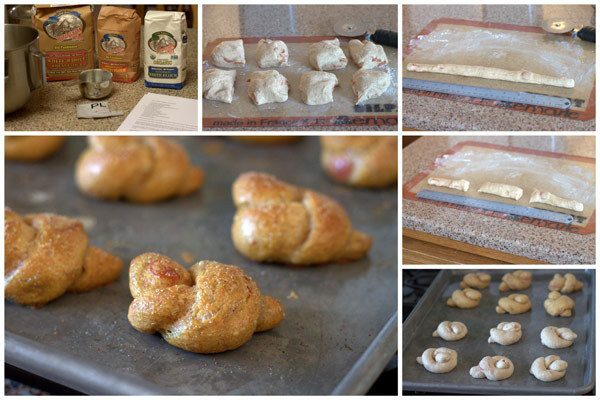 I love the idea of the pepperoni pizza pretzel knots. How clever! Now this is a recipe I can sink my teeth into, literally. Cannot wait to try these. I was just thinking of these after you told us about them!! They look so tasty!! Oh boy could I go for one……or two………of those for lunch. They look delicious. Great football food too. Whole wheat pastry flour is my “go to” for any recipes that require flour. The texture is wonderful to work with and I always appreciate the extra kick of fiber. These pretzel knots are the perfect thing for game day. I’m bookmarking these for Super Bowl Sunday. They look wonderful and must taste really good. Great party food.